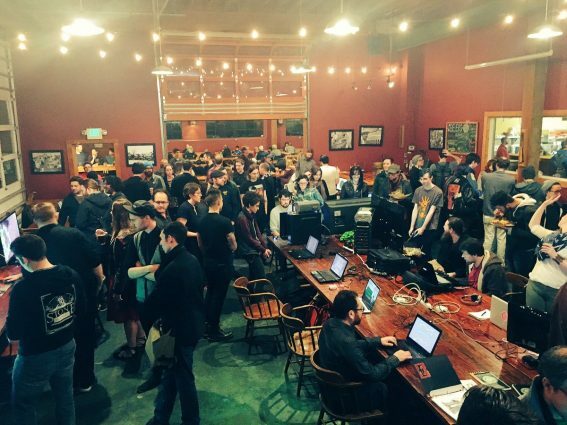 In true Portland fashion, PIGSquad chose the Lucky Labrador beer hall for this GGJ event. If you’ve ever been to the Lucky Labrador (or any beer hall, for that matter), then you know this was a sizable space. Walking in, the Lucky Lab greets you with rows upon rows of tables. Countless taps sat at the bar on the far side of the hall, but it was instantly clear that most people who came in after 6:00 weren’t quite as interested in the brew as what was stirring in the event space across from the serving station. The space was lined with the life that few gamers are ever in direct contact with. Developers disconnecting and reconnecting monitors, restarting laptops, and testing their newborn games just before the hungry crowds amassed. After a short introduction to the event by Will Lewis, the mightily bearded founder and president of PIGSquad, the floor briefly felt like a middle school dance. No one came with a date, but all of the available partners were sitting at tables waiting to be asked for a spin. Some teams were still tinkering with their projects. At first, it almost felt rude not to ask to play a game before sitting down with it. May I have this dance? Before the momentary panic wore off, I moved to an open seat and began playing Palinopsia, a puzzle game where the player must click on mirrors to move a constant beam of light through multiple stages. 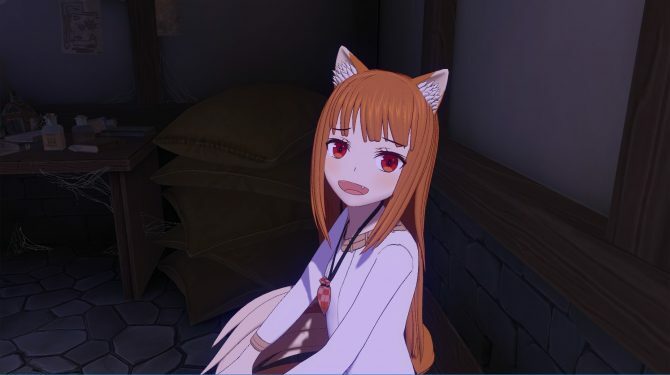 As was the case with most of the games, at least one member of the team was present to more or less explain the object of the game or at the least its basic control scheme. Palinopsia only required the click of a mouse. So, I began rotating mirrors and quickly found my beam entering the next stage. Feeling fairly confident and not at all wondering how the game might become more challenging, I continued rotating mirrors until the stage just exploded. I continued the game up until the end (or the end of what was provided at the event), but that thought stayed with me through the entire night. It’s not often that we, as gamers, get the opportunity to interact with the people who craft what we love. In many ways, the content of a game is the only dialogue we share with developers. 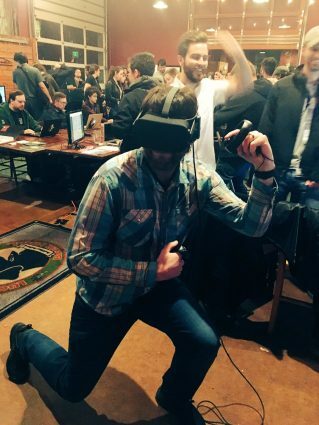 But at GGJ, gamers got to see where the passion lies for the other side of that conversation. For Cristiano, it was in part knowing that his game might briefly stun someone, especially within such a short slice. And yet, he stood beside me through the entire fifteen minute section, watching how I would tackle each new stage. I couldn’t help but feel he cherished the opportunity to have an actual conversation with his audience. That feeling carried on throughout the night, as I visited each station, sampling the fruits of 48 hours of labor. I eventually came to Skylight, a space-flight shooter that focuses on exploration, upgrades, and ensuring your ship’s solar energy doesn’t deplete. When I reached the table, I had the fortune of watching others play it a little. 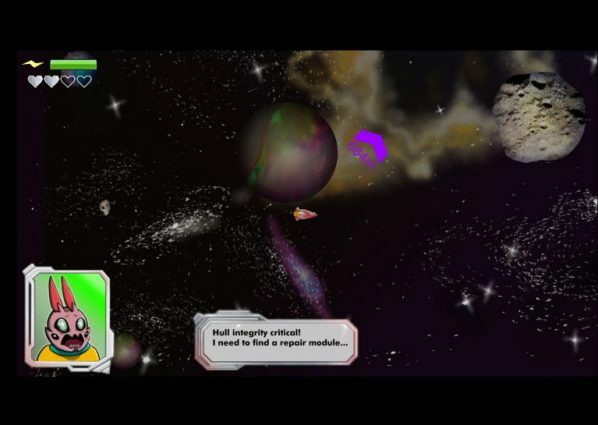 The goal of the game is to get the spacecraft home, designated by a purple arrow that points directly there. Naturally, everyone gunned it towards the arrow. When the game’s designer Kevin John arrived, he spoke to me about how strange he found it that everyone’s approach seemed to be the same: players would quickly run out of energy, fly directly into black holes, asteroid fields, or become trapped by a planet’s gravitational pull. Kevin explained to me that they had designed the game to be a little more leisurely paced. He told me there were a number of upgrades that made travel easier, and that it was possible to slingshot around planets to conserve the ship’s energy. However, he did admit that neither of those details were completely apparent upon first approaching the game. After my miserable failure at the game, Kevin and I discussed the possibility of further developing it. He didn’t seem to feel confident that Skylight would ever become anything more or that the team would further pursue it. In fact, I found that sentiment echoed by many developers throughout the night. Where the GGJ had generated concepts some found worthy of further development, others decided the projects were either defunct or less interesting than those they were already developing. But, those who were likely to later forget their GGJ projects were not at all regretful of having the experience, regardless. Jetpack Fishery, the next title on my tour through the event, is a local multiplayer game about fisherman armed with jetpacks and nets. 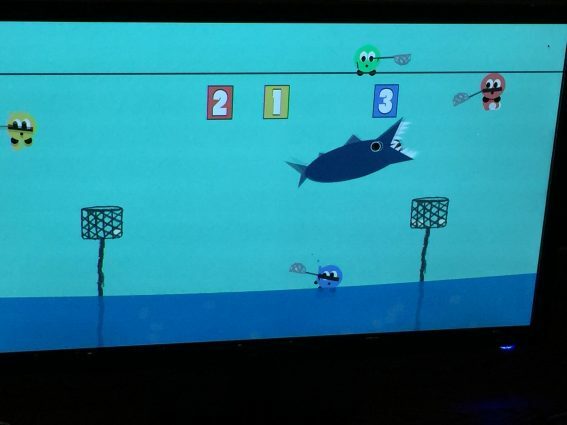 Upon scooping up fish as they jump out of the water, players must deposit them into baskets situated on either side of the arena to score more points than everyone else: all of this while a shark indiscriminately roams the screen to take down unsuspecting fisherman. With four people competing, everyone frantically rushing for the next fish to leap out of the water, it was clear that this game was intended to be some clean fun. And fun it is. In speaking with developer Jacob Alan McCosh about his work on the game, he too mentioned that it probably wouldn’t see any further development. 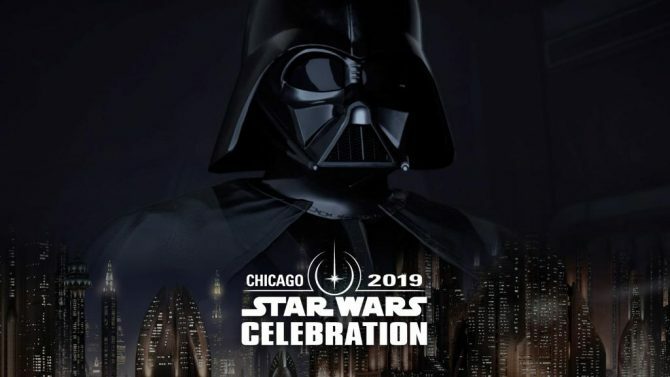 I had gone into this event believing that many of the developers’ projects would become full-length projects, but it was rarely becoming the case. The way Jacob put it, he had participated in order to challenge himself: more specifically, he wanted to create more organic looking limbs. That’s when he pointed out how the blobbish fisherman’s arms moved, whipping around, stretching, bending as the nets swung forward and back. From that point onward, I couldn’t look away from them. I realized that Jacob had spent 48 hours almost entirely toward the end of creating that aspect, and without talking to him I would have never noticed it. It made me wonder how much I’ve taken for granted in the smallest moments of the games that I play each and every day. 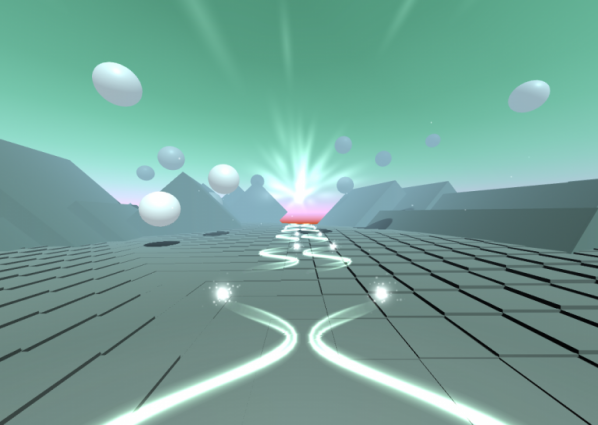 The last game I played that night was Undula, a game that utilizes an Oculus Rift headset and Touch controls to immerse players in a musical experience and requires them to move their hands along tracks that “undulate” with the music. Although I’ll admit that it had the benefit of a lasting impression, this was probably my favorite game of the entire evening. It’s a simple concept, but unlike so many other games that I had played, it didn’t try to score me or encourage me to win. It allowed me to be comfortable, to move about and explore the space the team had created. However, developer Joel McDonald seemed a little conflicted on this note. 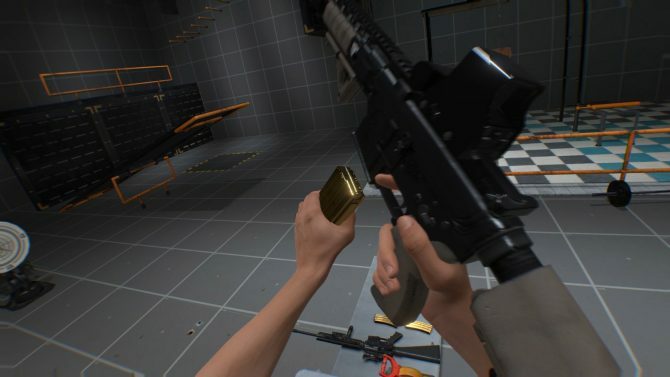 Although the team had ultimately decided to create an experience that would give players the ability to just move to the music, they were afraid that there wouldn’t be any driving force behind continuing to play the game without some measure of points or performance: that might add a level of frustration or dissatisfaction from the overall experience. 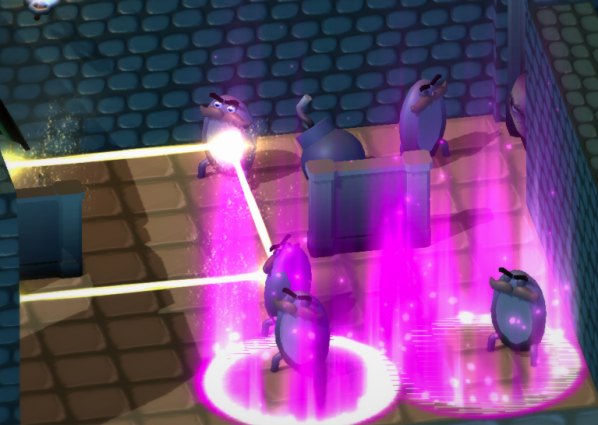 In lieu of grading the player, they decided to let the music dim when the player fell off of the tracks or to let the tracks turn green when the player was in just the right place. In this way, they preserved the desired tone while also passively allowing Undula to feel like a game. In my experience, I hardly noticed as Undula assessed my coordination skills. My time with it was nothing less than a joy. Much like Undula, the overall GGJ event was about enjoying and learning from the journey, not necessarily the end. 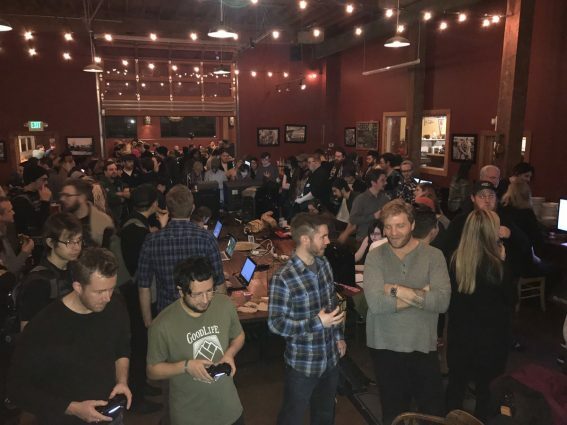 So many gamers, developers, or sometimes just creative minds congregated at the Lucky Lab with a common interest, but also with wildly varying goals. 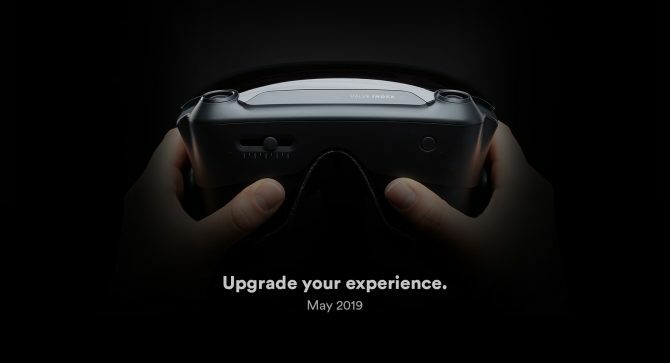 Many looked at it as an opportunity to more finely tune their craft; some actively pursued further development and support for their newest project (Palinopsia is on Steam Greenlight right now). One title, The Portland, Oregon Trail was a team’s multi-year dream finally come to fruition. Many more people were there simply because they love to create and play games. For me, it became even more of a reason to look a little closer at the details of what I play. Someone, somewhere spent days of his/her life just to craft the hands of my next favorite video game character. Thanks to Global Game Jam and PIGSquad, I may have already met that person. 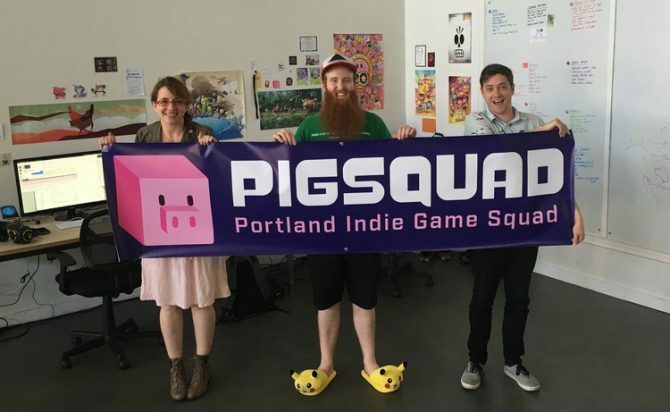 PIGSquad is an organization that was established in 2011 for the growing indie game developer population in Portland, OR to build a network of like-minded, creative individuals. Today, it facilitates events to bring the community closer to this budding industry, as well as to allow its members to continue creating work they can be proud of. Members come from all walks of life. 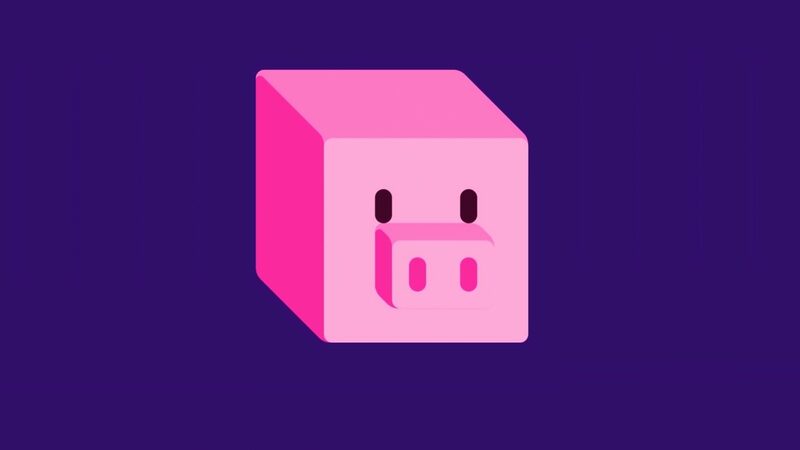 If you’re interested in how to join or simply want to hit up the next Global Game Jam event in Portland, be sure to check out PIGSquad’s website. Don’t forget that these Global Game Jams are being held… globally. Check out the link if you’d like to meet the next great developer near you. Hey, maybe that could even be you. Of course, if you’d like to see more of the games that were mentioned here or are even interested in some of the many I wasn’t able to detail, you can visit the Global Game Jam website for the final products to come out of the January 20, 2017 Portland, OR event.